Supplement outdated science textbooks with our environmentally focused resources. These activities and guides will encourage your students to live a "greener" lifestyle, at home and at school. By teaching children at a young age to be environmentally aware, you are building lifelong habits that could potentially make a dramatic difference in the future of the earth. 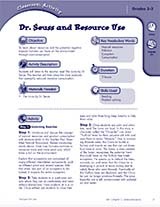 The activities and resources include methods for reducing waste and trash, information about product consumption, recycling tips, facts about pollution and its effects on the environment, global warming statistics, worksheets on different ecosystems, and plenty of projects for students to complete inside and outside the classroom. Enhance students' comprehension about air pollution by using these resources. Included is a vocabulary printable, creating a wanted poster, along with enrichment and hands on activities. These resources will extend student learning. Lessons include home projects, role playing, and a nature walk to collect information about ecosystems. Our list of resources is full of choices to make great lessons. Choose from cross-curricular and regular lessons to increase students' environmental learning.